The key to this mini quilt is the fabric selection. To select your own unique fabrics, I suggest auditioning your choices for the fabrics side by side to evaluate the effectiveness of the color value and color gradient between each transition. Taking a photograph of the fabric you are auditioning and looking at the image in grayscale is a helpful method to evaluate the transition in value more effectively. The fabric requirements and instructions are written with Fabric A being the lightest value, Fabric B being a mid tone, and Fabric C being the darkest value. Place two squares right sides together. Mark a diagonal line from corner to corner on the wrong side of the lightest fabric. Sew a scant-¼ʺ seam allowance on either side of the marked diagonal line. Press to set seams. Cut along the marked diagonal line to form (2) HSTs. Press seams open. Using (4) Fabric A and (4) Fabric B 5 ½ʺ x 5 ½ʺ squares, make (8) A/B HSTs. Leave untrimmed. Using (4) Fabric B and (4) Fabric C 5 ½ʺ x 5 ½ʺ squares, make (8) B/C HSTs. Leave untrimmed. Place an A/B and a B/C HST, right sides together, matching the direction of the HST seam for both blocks and alternating the colors. Mark a diagonal line from corner to corner running perpendicular to the HST seam. Cut along the marked diagonal line to form (2) A/B/C/B hourglass blocks. Press seams open. Trim hourglass blocks to 4 ½ʺ x 4 ½ʺ square. Repeat to create (16) A/B/C/B hourglass blocks. Tip: To get a crisp point in the center of your hourglass block, line up the seams accurately. I use 2 positioning pins (each pin 1″ from the marked center line). Insert a pin from the top layer directly through the seam (seams that are pressed open make this easier). Turn the fabric over to confirm that the pin is passing through the other seam. Adjust if necessary. Noting the orientation of the hourglass blocks, follow the assembly sequence illustrated below to sew the pool block together, pressing each seam open. The pieced mini quilt top should measure 24 ½ʺ x 24 ½ʺ square. Layer backing (wrong side up), batting, and quilt top. Baste the layers together using your preferred method. Quilt as desired. From your binding fabric, cut (3) 2 ½ʺ x WOF strips and join the strips together using your preferred joining technique to create a double folded binding roll. Trim quilt square and bind using your favorite binding technique. Congratulations! 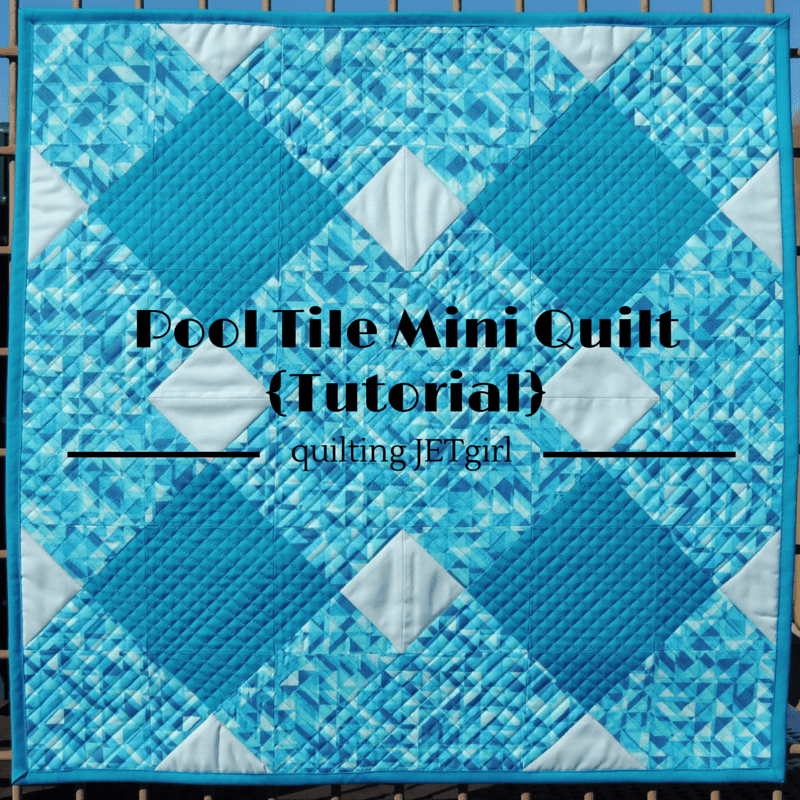 You have completed a Pool Tile Mini Quilt! I would love to see what you create. If you are on Instagram, tag me (@QuiltingJetgirl) and any images of your quilt using #PoolTileMiniQuilt. Or send an email to jetgirl8(at)gmail(dot)com with a photograph or a link to a blog post about your quilt! A digital PDF of this pattern will be send to all those who have signed up via Patreon to be one of my Patrons. You may also purchase a copy of the mini quilt PDF pattern from my Craftsy or Etsy shops, on sale for $5 through February 15th. And don’t forget that Red Herring’s sale price of $6 ends this Friday, February 5th! Great tutorial and mini! Very clear and great illustrations. Your tutorial is perfect! I love that you always give a helpful tip! I will have to give this one a try! I love how quick and simple this looks to piece! I’m super tempted to go make one right now, but really it’s just the procrastination talking and I need to stop listening to it. Good Morning Yvonne! Thank you so much for this fabulous mini quilt pattern and tutorial! I will be making one of these for sure in the next couple of days. Yesterday, I was cutting into some spectacular orange fabrics that I purchased on a quilt run with a friend a few years ago, waiting for the right projects, and now there are two! All smiles and giddy as a school girl….thank you again! Have a fantastic creative day! Thanks so much for the tutorial! This is great! Great tips with the colour choices, as well as such a clear tutorial. Thanks for sharing this tutorial with us Yvonne. I’m not sure when I’ll get around to making it…but hopefully one day! Great tutorial. Your fabric choices are so pretty! It’s a beautiful mini and I love the way it seems to sparkle like water. Yvonne, as always, your tutorial looks great! When you first posted the quilt, I didn’t even see the hourglass units until now. Yvonne, thank you for the tutorial! You are always so generous in sharing your knowledge! Such a cute mini and a very straightforward pattern. It’s the fabrics you used that make this shine. Thanks! I’m saving this for a future project. My list keeps getting bigger. Excellent tutorial. Very cute quilt!